The luxurious Villas Catalina Townhomes with incredible ocean views are located in Potrero with views of Flamingo, the Catalina Islands and beautiful sunsets on the Pacific. Villa Catalina Townhome #10 has balconies off every room and perfect for enjoying the magnificent ocean views. This particular unit has the best location and views within the Villa Catalina project. The pool is closeby and the views are completely unobstructed. The property was finished and furnished with high end furniture and is one of the best rental properties in the area. You can enjoy spectacular views from the infinity edge swimming pool or take a short walk to Playa Prieta and relax on the beach! The owners have furnished this property beautifully to match the surroundings and incredible views. All balconies have comfortable outdoor seating for sipping your evening cocktails, relaxing and enjoying the sunset views! Just bring you clothes, personal items and enjoy your next vacation to Costa Rica. All three bedrooms have private baths. The master bedroom has a king bed and bath with shower and jacuzzi. One guest has bunk beds and the other guest room has a queen bed. The Area: Villas Catalina Townhomes are located in Potrero on the road to Sugar Beach with views of Flamingo and the Pacific Ocean with sunsets. Playa Prieta is a short walk across the road. Prieta Beach is secluded and private off the main road. Penca Beach and Sugar Beach, two local favorites are just a short 5 minute drive or a 15 minute walk. Flamingo Beach is about 10 minutes by car and Conchal about 15 minutes. The Flamingo/Potrero area has many beautiful beaches to choose from. Surfers can go about 20-30 minutes to Tamarindo or Playa Grande for world class surfing. The townhome is about one hour from the Liberia International airport and is close to many tourist activities such as canopy tours, sport fishing, horseback riding, diving, and eco-tours. Various restaurants and bars in the area have entertainment different nights of the week. Restaurants: Located within 5 minutes from this property are several restaurants including: Las Brisas beach bar and restaurant, Sol Y Mar typical food, Marco Polo Italian restaurant, Sugar Beach Hotel restaurant and The Green House restaurant at Playa Dante. Just a short 10 minute drive to Flamingo and you will find Angelina's restaurant, Coco Loco beach front restaurant and the old favorite's Marie's and the Mariner Inn. Brasilito, about 15 minutes away, is famous for Tiki's, Papaya, the Golden Shrimp, and Outback Jack's. Villa Catalina Townhome 10: This townhome is a beautiful property that pictures can't do justice and words can't describe. It is finished and furnished with high end materials and furnishings. The development is fully contained and has full time security guards and gate. Best of all is the incredible views from the infinity edge swimming pool. The swimming area has bathrooms, a covered area and BBQ. Perfect for hanging out or cooking out! Ocean view! Spectular Sunsets! Great Pool! Very nice. Absolutely worth the money. One of the keys to a great villa rental is good beds! This condo had great beds for everyone; big rooms and plenty of space for two active kids and two adults. We needed a little help to get to Playa Penca but it is only a 5 minute walk (right out of the complex, down the dirt road, left at the "gate" in the fence). Whole place was very quiet; restaurants were super and the people very nice! Hint on driving from Liberia: If you don't get a 4x4 make sure you take the longer, fully paved, route to the condo. Especially if it's been raining! We truly enjoyed our time and the help of Special Places. Would use them again! Villa is beautiful! Ocean view is breathtaking! Villa is beautiful! Ocean view is breathtaking! Bedrooms are large and comfortable, plenty of towels available. Short walk from 2 best beaches of Costa Rica. The area is very safe, and property owners were very helpful. We got excellent customer service. This was my first time to Costa Rica and we had a trip of a lifetime! The villa was so nice, spacious and breathtaking views! Every morning we woke up to the sounds of howler monkeys and birds, made breakfast and enjoyed it out on the porch over looking the ocean. Nothing is more spectacular and peaceful! The villa is so close to several amazing beaches- it was hard to choose which beach to go to for the day!! We met up with Walter Marchani to do a morning of SUP (stand up paddle boarding) and snorkeling. He brought the boards/paddles and the snorkels and showed us a great time! The villa is also close to several great restaurants- The Beach House, Coco Loco and The Shack, to name a few. It was easy to get food from local food markets if you wanted to cook in. The kitchen is stocked with everything you can imagine + a grill. Can't wait to go back!!! 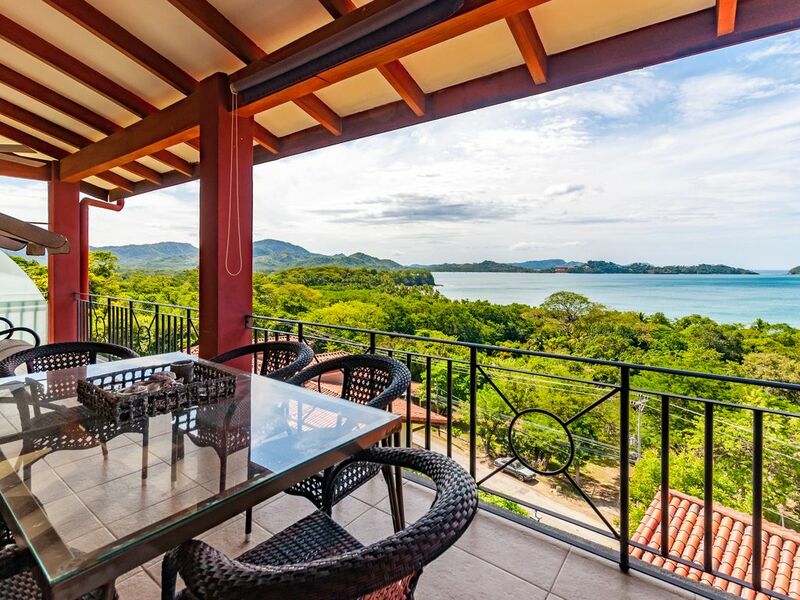 We loved every minute of our stay at this wonderful spacious villa on the Gunacaste coast. It was very comfortable and secure. Waking up to the spectacular views and the sound of the local wildlife was simply paradise. Our three older teenagers loved having their own space and hanging out at the infinity pool. The location was ideal for exploring the many beaches along the coast with easy access to a variety of restaurants and local stores. This was our first time to Costa Rica and we loved it! all the people have nice review for your place. Flamingo and Potrero are well known for world class sport fishing, diving, sailing, as well as other tourist activities such as canopy tours. This is one of the most beautiful beach areas in Costa Rica. Still not over populated and has well maintained beauty. Golf: Costa Rica and the Guanacaste area has several superb golf courses including: Melia Conchal, the Four Seasons Resort, Hacienda Pinilla and Sardinal Golf Courses. CHECK-IN TIME IS 2 PM CST. CHECKOUT IS 11 AM CST. Alternate times may be accommodated based on scheduling. NO Early Check-in or late Check-out unless confirmed by Special Places in writing via email. 5. PAYMENT – An advance payment equal to 50% of the total rental rate is required to secure the reservation. The advance payment will be applied toward the house rent. Payments can be made in the form of a wire transfer, credit card or cashier’s check. The advance payment is not a damage deposit. The BALANCE OF RENT is due thirty (30) days before your arrival date. 6. CANCELLATIONS – 50% is due at the time of booking and the balance is due 30 days prior to the contractual arrival date mentioned on page #1 of the original contract. In the event that you need to cancel your rental less than 60 days prior to your arrival we are happy to offer a credit to stay at the same property within a one year period. This credit is subject to availability of this same property and applicable for dates with the same nightly rental rate or less. Credit is only given if 100% of all applicable charges are made according to this first contract. If you cancel more than 60 days prior to your arrival and we are able to re-book the property, we will refund you the deposit minus a $100 processing fee plus all credit card and transfer fees. A credit or refund are not available for holiday period rentals. We recommend purchasing inexpensive travel insurance in case of last-minute cancellations.